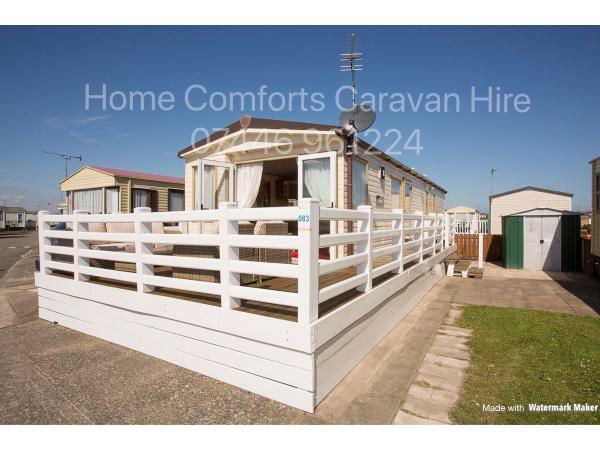 We own a selection of other caravans, all available for hire on Golden Gate - please see Ref: 6959, 1669, 846, 2465, 2617, 3145, 1835 1692, 2463, 2964, 451 and 1551 on this website for further details. Check-in from 1.00pm check-out by 10.00am. Thank you for enquiring about our ABI St David, please fill in the requested information. If you're looking for modern, stylish accommodation that offers high end quality and comfort our St David caravan is the perfect choice. The lounge now has a large 3 piece suite comprising of 2 armchairs & 4 seater sofa (photos show the old seating) 42in TV with built-in free-view, Sky (there is a Skybox but only has the free channels so you want to bring your own Skybox for more choice). 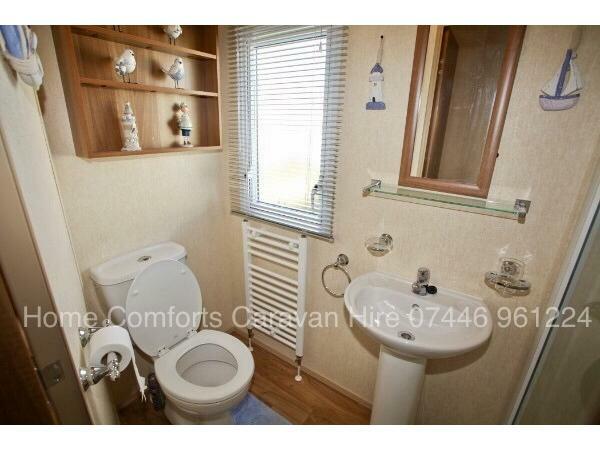 It is fully double glazed and has full gas central heating throughout. There are french door at the front that open out onto the large wrap around decking with plush rattan suite. 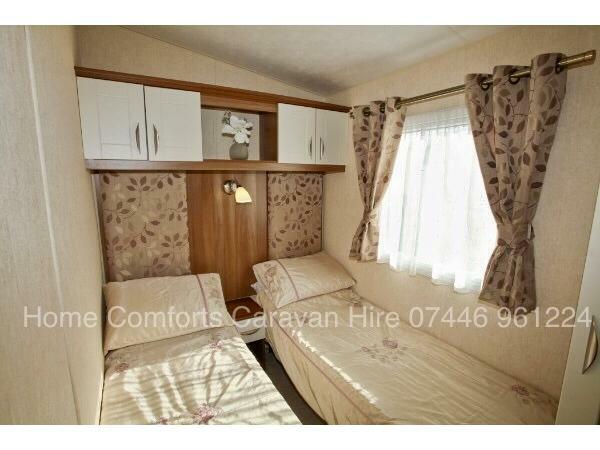 At the side of the caravan is a spacious parking bay. The well equipped kitchen has a full size integrated fridge/freezer, dishwasher, microwave, kettle, toaster, oven, slow cooker, Tassimo drinks machine, all pots, pans, cutlery, crockery, ovenware etc plus plenty of work space and storage. There are 2 x twin rooms, both have wall mounted tv's, plus plenty of storage. All mattresses and pillows have protectors fitted, duvets and pillows are provided. Bed linen is not included in with the hire price but can be supplied for a small fee. The bathroom has a large double size shower enclosure with an impressive power shower, wash basin, toilet and heated towel rail. The St David sleeps 6 people. Check-in is from 1.00pm, check-out by 10.00am. Golden Gate is perfectly located as it's within walking distance of all the local attractions including shops, markets, including Tir Prince which has upto 400 stalls. Family friendly pubs, clubs, restaurants & amusement arcades, takeaways most of which will deliver to the site. There are 2 funfairs where an unlimited rides wristband costs from just £9, go-karts, gifts shops, a beautiful sandy beach that extends for miles is just a few minutes walk away plus so much more to keep everyone happy & entertained during their holiday. In the surrounding areas you'll find great places of interest to visit including slate & copper mines, Welsh Mountain Zoo, Chester Zoo, Castles, Snowdonia, The Great Orme, Angelsey, Llandudno & so much more. or give the car a rest and take the open top bus from outside the camp gates or maybe the train from Rhyl or Pensarn to Llandudno, Bangor or Caernarfon with its shops, children's play centres and castle. Myself and my family stayed here for a week from the 21st of July, this was our 3rd year in this caravan. We love it, its like a home from home for us. 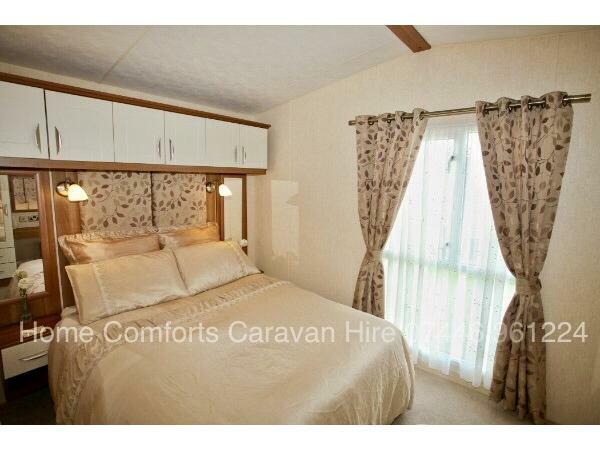 We have never had any problems with the caravan or the caravan site. Amanda is really approachable and always happy to help with any questions we have had. The caravan itself is always spotless with everything you need. It has a sky box, so we always take our sky card with us. The kitchen is equipped with everything you need, including a dish washer! This year the caravan had new carpet throughout which was lovely. The bathroom is a great size and the shower is really powerful, there is also a 2nd toilet off the master bedroom, very handy when you have children! We love having decking with the outdoor furniture, its lovely to sunbathe or sit out in the evening. 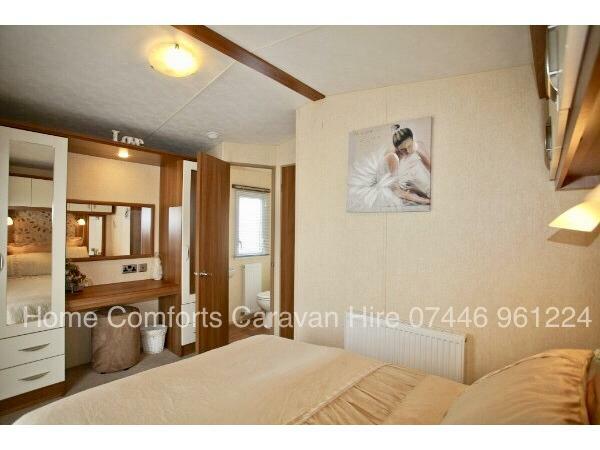 The caravan is in fab location on the site. All in all we cant fault it! We would definitely recommend staying here. Lovely caravan. Really enjoyed our Stay. Club house had just been refurbished and I believe they're opening a new swimming pool this year. Couldn't recommend more.